Adrienneats: Spring, a balancing act. This time of year my diet switches from warm to cool. We tend to eat heartier, cooked meals to keep us warm in the cold of winter. When temperature becomes warmer, our bodies want lighter, refreshing meals that are often raw or chilled to keep us cool. I mean really, who wants to turn on the oven in 90 degree weather? While the temperatures in spring and fall are not as extreme as winter and summer (especially in the South), our diet becomes more of a balancing act, a mixture of cooked and raw dishes. Spring casts a green hue over the earth and is visible at the farmers market. Asparagus appears as do pea shoots, lettuces, spinach, leeks, green onions and a variety of herbs. Salads begin to fill my fridge instead of hearty soups or tamale pie. Chilled bean salads become a regular on the dinner table. The flavor changes based on the herbs and vegetables available at the market that week. A few weeks ago, I made this soup and had leftover dill oil in the fridge. I decided to add a spoonful into a salad of chickpeas, celery and avocado. 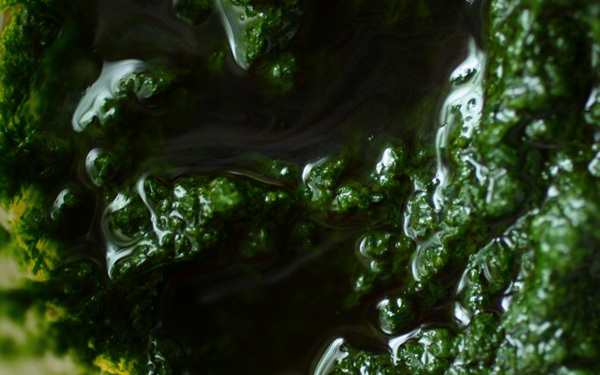 The dill oil mixed with lemon and parsley adds a pungent kick to this chilled salad. The crunch of the celery is nice contrast with the creaminess of the avocado chunks. Enjoy this refreshing salad over a bed of lettuce or spinach. It's easy to pack and eat on-the-go for lunch at work or for a lazy weekend picnic. Pour the chickpeas, onions, celery, avocado and parsley into a large bowl. 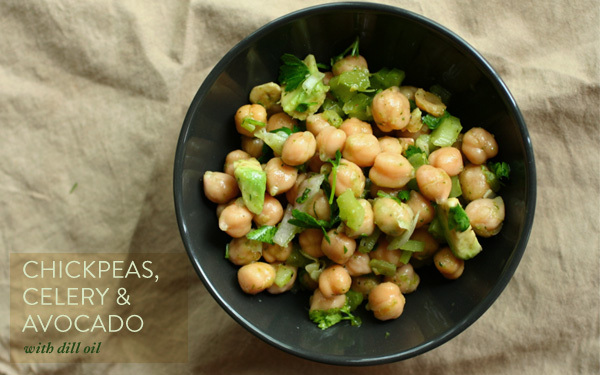 Mix together the rest of the ingredients in a smaller dish before mixing into the chickpea salad. Refrigerate for an hour or two, so the flavors will meld before serving. Enjoy! We made this. Lots of it. Three times so far since Saturday. My 13 year old daughter said, "is that the bean salad again" and when I said yes she said "YES.. I love that stuff". We used lots of cilantro, a little parsley and lime juice. I'm so glad to find your site. 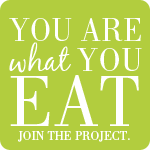 I love your encouragement to eat well and I need your wonderful ideas. So many recipes to try. Thank you so much!! Do you know how many calories there is in this salad? Giseli - I don't count calories, so I'm not sure how many this salad contains. But there are useful online websites that do that for you. You would have to manually enter the ingredients and exact amounts though. Giseli don't worry about the calories of it. Worry about the quality of the food your eating.